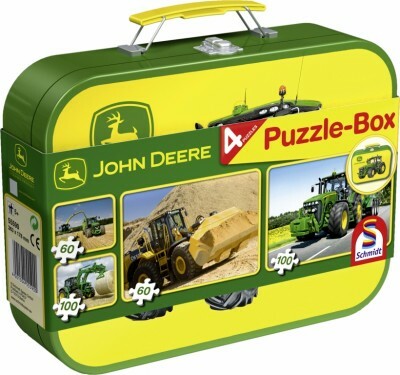 High quality jigsaw puzzles in a smart, keepsake tin with a handle. Finished puzzles measure 360 x 243 mm, 14.2" x 9.6"
Set of 4 jigsaw puzzles, including 2 x 60 piece and 2 x 100 piece, all picturing John Deere tractors and construction vehicles in action. Perfect for young John Deere enthusiasts.